As part of their campaign to increase transparency when it comes to alcohol usage on campus, the Student Wellness Center released data from 2018 with revealing statistics about alcohol consumption among students. While most of the data stayed the same or close to last year’s figures, alcohol-related incidents with Safety and Security and/or Residential Education increased by 49 incidences. Many groups and individuals on campus watch these numbers with scrutiny to improve Dartmouth culture and the safety of students. The data compares alcohol-related incidents with Safety and Security and/or Residential Education, Good Samaritan calls, medical encounters with blood alcohol levels above .25 and medical encounters with Dartmouth-Hitchcock Medical Center or health services. The Student Wellness Center began collecting data on alcohol consumption in 2011, when there were 62 blood alcohol concentration encounters above .25. For Caitlin Barthelmes, director of the Student Wellness Center, this high number of BACs above .25 was especially troubling, considering that a BAC above .25 approaches a lethal limit. That number now tends to stay under 1 percent despite some fluctuation year to year. Another closely-watched statistic is the number of Good Samaritan calls made each year, which allow students to seek medical help without facing punishment from the school. Good Samaritan calls increased over the past three years until 2018, when they dropped from 131 to 117 calls. Hannah Hoffman ’19, director of Dartmouth EMS, said she was heartened that students are often using the Good Samaritan policy. “These figures demonstrate that students continue to make use of the Good Samaritan policy, a trend that our organization certainly appreciates and will work to maintain,” Hoffman wrote in an email statement. Barthelmes is not the only one who has noticed considerable changes in campus in the last few years. Hanover Police Chief Charlie Dennis has observed the ways in which policy has changed campus culture. 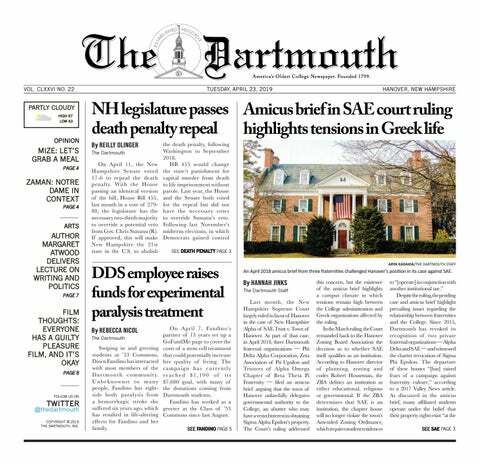 When the College announced the Moving Dartmouth Forward Initiative in tandem with the hard alcohol ban, the impact could be seen by the police department, he said, and added that their numbers are smaller than they were five years ago. Barthelmes said that the Student Wellness Center is watching closely to see how alterations at the institutional level play out on campus. Although the data must be analyzed as a whole, certain pieces of information can reveal different parts about the culture surrounding alcohol consumption on campus. The alcohol-related incidents with Safety and Security and/or Res Ed, for example, don’t necessarily indicate high risk drinking, according to Barthelmes. While these figures are used to alter policy and rules on campus, real change is fundamentally determined by students.